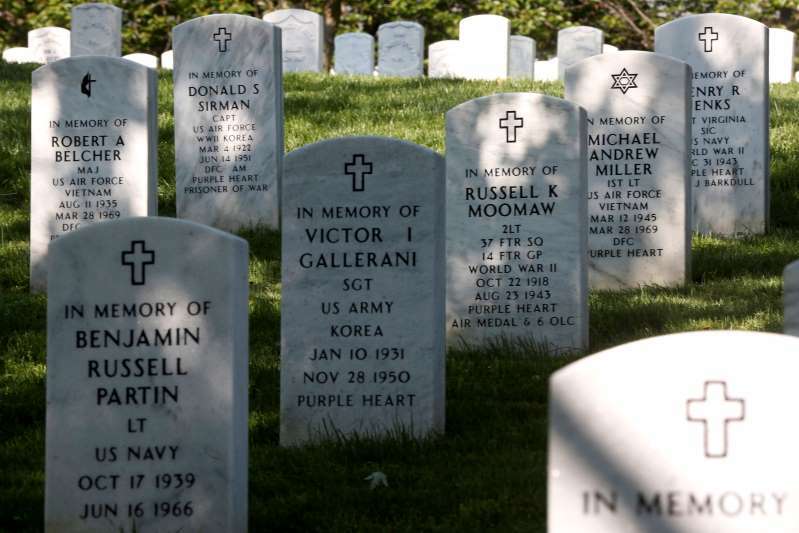 The white marble headstone in Arlington National Cemetery memorializes Victor I. Gallerani, sergeant in the U.S. Army in Korea, recipient of a Purple Heart. But no one is in the grave below. [post_ads]The dates on the headstone are at least partly correct. Gallerani was indeed born on Jan. 10, 1931. Whether he died on Nov. 28, 1950, is a mystery his family has wanted to solve for decades. No trace of him ever came home. Gallerani’s family is one of thousands hoping the U.S. government will soon recover and identify the remains of their loved ones from North Korea, after wondering for decades what exactly happened on the long-ago battlefields of the Korean War. At their historic summit last month, President Trump and North Korean leader Kim Jong Un committed to recovering more American remains, including the “immediate repatriation of those already identified.” Their statement raised hopes that as many as 200 sets believed to be ready for transfer could be collected in coming days and possibly more in the near future. But the up-and-down nature of past efforts suggests the process could be fraught with pitfalls, including a mixed record of cooperation from the North Koreans. Any successful repatriation also will face the laborious identification process that has dragged on for years with the remains already in U.S. possession. The Pentagon estimates nearly 7,700 U.S. troops are unaccounted for from the conflict, including 5,300 believed to have been killed north of the 38th parallel, which marks the border between the two Koreas. The U.S. military has not recovered remains directly from North Korean officials since 2005, when the administration of George W. Bush stopped the program as tensions between Washington and Pyongyang rose. Trump told a crowd of supporters on June 20 that 200 human remains had already “been sent back.” But U.S. military officials said afterward that was not the case. Repatriation also has been complicated by money. The United States has sent North Korea $22 million since 1990 as it recovered an estimated 629 sets of remains, said Chuck Prichard, a U.S. military spokesman. The Pentagon says it reimburses North Korea for the costs of recovery but does not pay for the remains themselves. Critics see that as akin to a fig leaf, with the North Koreans running up the tab to help pay for their nuclear program. Once recovered, remains are usually transported to a laboratory at Hawaii’s Joint Base Pearl Harbor-Hickam run by the Defense POW/MIA Accounting Agency. It focuses on recovering prisoners of war and U.S. troops listed as missing in action and employs historians and scientists to help with identification. DNA testing and another analysis will be applied to not only sort through the human remains, but also to determine whether animal bones have been mixed in — which the North Koreans have been accused of deliberately including in the past. In the absence of recovery efforts involving the U.S. military, former New Mexico governor Bill Richardson visited North Korea in 2007 with approval from Bush, recovering the remains of six U.S. service members. The North Koreans extended an offer to restart the repatriation program, Richardson said, but it fell flat when it became apparent Pyongyang’s weapons programs were growing. In 2011, the United States and North Korea again began negotiating parameters under which U.S. military teams could travel alongside North Korean representatives to sites at the Chosin Reservoir and Unsan County, where the U.S. military suffered significant fatalities after China entered the war. The Pentagon announced the plan in January 2012 but ultimately scuttled the mission after more ominous suggestions from North Korea about the safety of U.S. troops involved, Russel said. In 2016, the Richardson Center for Global Engagement, run by the former governor, sent another team to North Korea to bring home Otto Warmbier, the American college student who was arrested and accused of attempting to steal a political poster. Richardson said the plan included recovering Warmbier, who died in Ohio last year after North Korea returned him with severe brain damage, along with several sets of human remains. In an attempt to keep the trip low-profile, Richardson stayed behind and sent the center’s vice president, Mickey Bergman. The group returned to the United States in September 2016 with an offer from North Korea to repatriate the remains of about 200 deceased service members, Bergman said. The timing was complicated. The Obama administration continued to be “quite wary of taking the North Korean bait on some sort of diversionary tactic,” as Washington prioritized the threat of Pyongyang building up its nuclear weapons program, Russel said. Then Trump won the presidency that November. Bergman said his group floated another proposal in which the president-elect would send a Trump Organization plane to the Korean Peninsula to recover remains before he took office. But the plan never got traction. That has been little consolation to Rick Downes, whose father, Hal, has been listed as missing in action since 1952, when his B-26 Invader went down northwest of Pyongyang. Rick Downes, who was 3 at the time of his father’s disappearance, traveled with Bergman to North Korea and said it was a “very frustrating, angry moment” when the Obama administration informed him afterward it would not pursue the remains because of the other considerations. [post_ads]Now, relatives of unrecovered service members are hopeful that repatriation will resume under Trump and give the stories of their loved ones a proper ending. “I’ll be home as soon as we get rid of those damn China reds,” he promised. Waite remembers how she would stay up late with her parents and watch the names of American prisoners of war scroll across the television, hoping to see her brother’s. Once, someone contacted her parents claiming to have information, but it turned out to be a scam. The family decided to have a memorial service after the U.S. military issued a “presumptive finding of death” in 1953. With only his picture on the altar at the church, and no casket, closure has proved elusive. Waite’s brother established a gravesite at Arlington Cemetery, where Victor’s remains will be interred if they are ever found and identified. The possibility of more remains being repatriated has raised cautious hope. Among them, Waite still dares to think, could be those of the dashing older brother she hugged goodbye in another century, who would walk her to the drugstore and buy her Hoodsie ice cream cups so she could add to her collection of movie star pictures on their tops.